OMAHA (Reuters) - Warren Buffett, the CEO of Berkshire Hathaway Inc, is known for his keen eye for a bargain. And there were plenty on offer for shareholders attending Berkshire's annual meeting over the weekend, where goods from some 50 Berkshire businesses were on show, often at big discounts. Shareholder Shelli Clausen thought a $5 kitchen spatula from Berkshire's Pampered Chef business fit the bill. 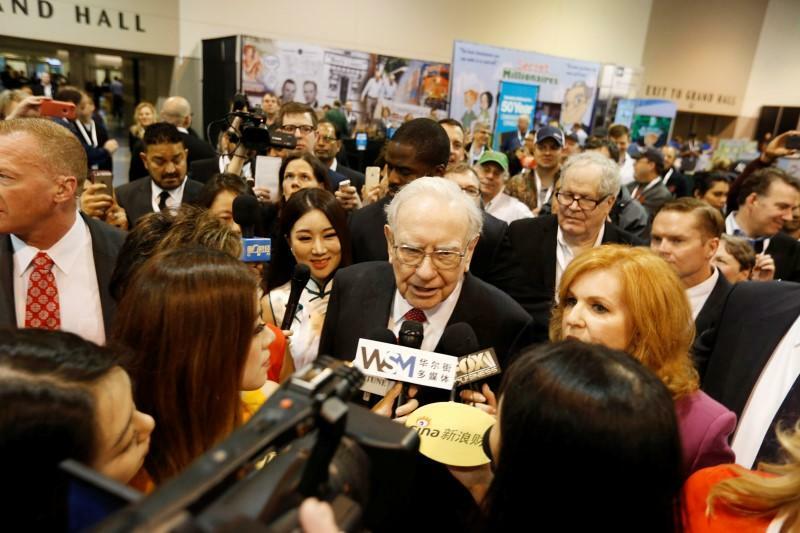 "It's a good buy, and it's fun to get the good deals," she said while waiting in a line a couple of hundred deep in downtown Omaha's CenturyLink Center, where Buffett had addressed shareholders and taken questions. When not listening to the Oracle of Omaha and his partner Charlie Munger, shareholders had two days to browse and buy Berkshire's products. These included See's Candies peanut brittle that Buffett and Munger chomped during the meeting. Courtney Cohen, a sales director at See's Candies, estimated that 19,000 of the 22,956 pounds of candy that the company brought to the meeting were sold. Dairy Queen events manager Dean Peters said those shareholders needing an ice cream fix consumed about 28,000 of its Dilly, Vanilla Orange and Fudge bars and its Mini Oreo Blizzards. Those with more to spend could buy a $9,277 pair of white gold diamond stud earrings from Borsheim's jewelry. Some vendors said numbers seemed down on in 2015, when Buffett celebrated his 50th anniversary running Berkshire. Official attendance was not immediately known, but this year's meeting was the first to be streamed online. This was widely cited as a reason Omaha may have attracted fewer people to the weekend of events that Buffett calls "Woodstock for Capitalists." Buffett said on CNBC on Monday that he thought attendance was down by 10 percent. Among the other Berkshire businesses on show were Kirby vacuum cleaners sold through in-home demonstrations and Fruit of the Loom clothing brand, which was among the more popular items. Fruit of the Loom had to put up a barrier at one stage to stop shareholders from overwhelming staff selling its $8 neon green "Berky Boxer" shorts, or the bright yellow 2015 edition for just $3. "It's packed, incredibly packed," first-time attendee Steve Peters, from nearby Papillion, Nebraska, said. He and his wife Marlene had just bought a bed from Nebraska Furniture Mart and jackets from Fechheimer Brothers. "There are good deals," Marlene Peters said. Just what Buffett would want his shareholders to say.